Zestec’s innovative ‘Refinance’ scheme provides business owners with a highly transparent, seamless and efficient way of unlocking the value of your existing solar PV system from your balance sheet today. Whether you need cash to invest and acquire new equipment or plant, improve your existing facilities, develop new products or simply to repay bank borrowings, we can help you today. We will offer you a cash sum in return for you entering into a solar airspace rooftop lease and transferring your Feed-in tariff (FiT) payments to us. You will continue to benefit from completely free electricity and will have no worries or concerns about the system performance, maintenance and repairs, insurance or monitoring, as we will take care of this. You provide us with initial information enabling us to provide an indicative valuation of the solar PV system. We then organise a technical survey and confirm a final valuation. You agree to lease the airspace above your roof for c. 20 years. You transfer your FiT Agreement to us and in return receive a capital sum and continue to benefit from completely free solar electricity. We monitor, maintain and insure the system for c.20 years, at no cost to you providing complete peace of mind. After the remaining FiT Agreement term of c.20 years, ownership of the solar PV system transfers back to you. 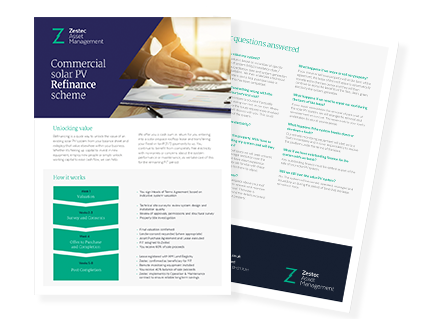 Refinance is also available for ground mounted and even floating solar PV systems. Use the cash to re-invest in your business rather than waiting another 20 years. Continue to benefit from completely free clean, green electricity generated by the system. The Lease is automatically transferred to new occupants of the property should you move to new premises. It is a very simple, straightforward and transparent process. You are in control at every step of the process and have a right to cancel until such time as we have executed the Agreements and processed the payment of monies due to you for your system. The typical timeline to complete the acquisition of a commercial solar PV system is 4-8 weeks, but this is dependent wholly on the specific circumstances of each individual transaction.